As I wound my way through the street markets of the lakeside town of Panajachel, dodging stalls laden with rainbow-hued tapestries and carts overflowing with cashews, I caught glimpses of Lake Atitlan at the end of the cobblestone street and had to disagree with Huxley–I would never get too much of the spectacular view. 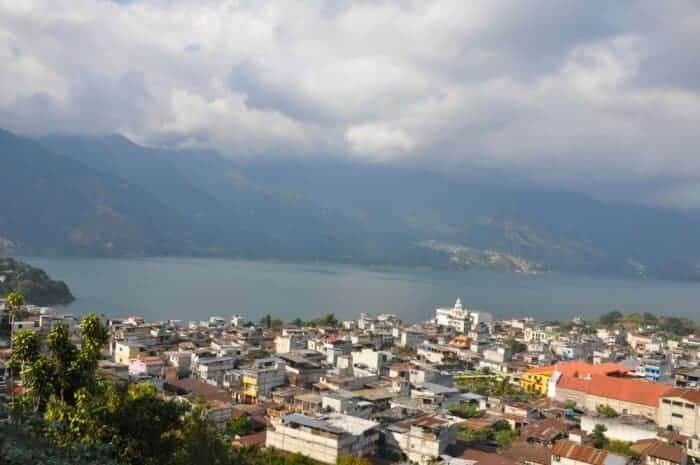 Set in the highlands, a 2-hour drive northwest of the capital of Guatemala City, Lake Atitlan has long drawn an international crowd of explorers, artists and even revolutionaries such as Che Guevara. Today, the beautiful lake is a draw for people studying Spanish, shopping for indigenous handicrafts and exploring nearby Mayan villages. But in order to truly understand a lake, any lake, you need to immerse yourself in it. You need to dive in, take a swim, take a boat ride across its waters, splash your feet along its shores. You need to do more than gaze at its beauty. 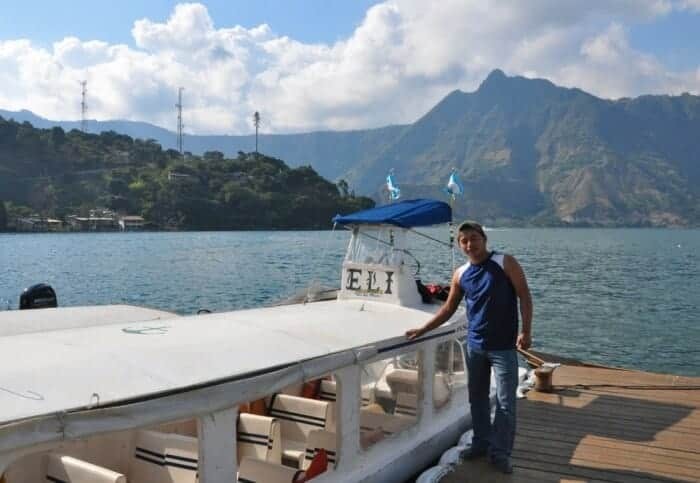 Accompanied by a local guide, a classmate and I decided to take a boat ride to San Pedro La Laguna, a tiny village at the base of Volcan San Pedro, a three-kilometre tall volcano on the opposite shore of the lake. It was part of an excursion offered by Jardín de América, the Spanish language school I’d chosen for my 2-month stay. 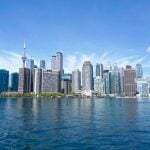 “As long as no-one asks me to talk in the future tense, I should be fine,” laughed Linda, a fellow Canadian who also studied four hours daily in the shaded garden at Jardín de América. Although she was in the Beginner level class and I in Intermediate, we’d meet up during the pausa, coffee time, happy to take a break from conjugating verbs. 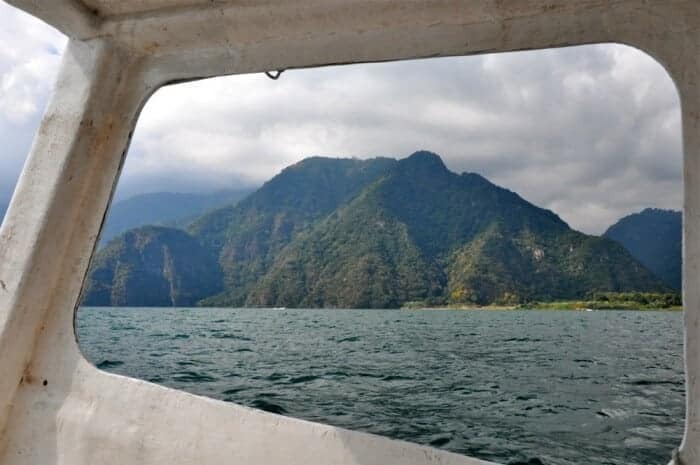 Since no roads surround Lake Atitlan, the only way to reach San Pedro La Laguna is by boat. We booked our fare at the ferry docks in Panajachel, opting for a shared boat to San Pedro la Laguna at a cost of 25 Q ( around $3). As we boarded a simple skiff with open air windows and wooden seats we took in the view. Surrounded by a necklace of volcanoes mirrored in turquoise-jade waters, Lake Atitlan looks like an eye brimming with tears, a fitting image for a lake so deep the indigenous Maya people believe it to be a portal to another world. “Are any of these volcanoes still active?” I asked, looking at the three dark volcanoes looming before us. 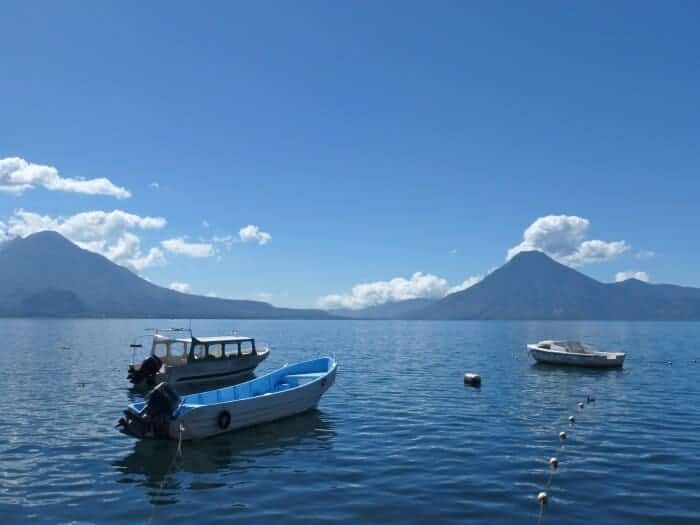 “San Pedro stopped erupting thousands of years ago but Atitlan and Toliman are still active,” he explained with a shrug of his shoulders suggesting he wasn’t too concerned. “Don’t some volcanoes in Guatemala erupt regularly?” I asked. San Pedro volcano certainly looked as though it could be alive. Sunlight skipped across its green slopes so it seemed to shape-shift before our eyes, becoming closer one minute and then dark and brooding the next. Upon arrival at the San Pedro la Laguna dock, still wobbly from the 25-minute boat ride, we jostled for space with locals on a narrow uphill path. It seemed Maya culture was very much alive in this village as most of the Tz’utujil people were proudly wearing their traditional traje, prism-coloured woven shirts for the men and wrap skirts for the women. It was a peaceful scene with shoeshine boys taking a midday break by jumping off nearby rocks to swim in the clear waters. Jose commandeered a tuk-tuk, a motorcycle with a cabin for two in back, and we were soon on our way to Parque Ecologico Volcan San Pedro in the cloud forest near the top of the volcano. The air was fresh as we hiked a narrow path flanked by a patchwork of avocado and papaya orchards. As we climbed higher, shade-grown coffee bursting with glossy red berries appeared. “Coffee needs three things to thrive–shade, sun and good soil and they get all three here,” said Jose. “Wow, look at that view,” said Linda, when we stopped for a break. We could see the whole town before us, a peninsula with the boat docks and the main square above it. 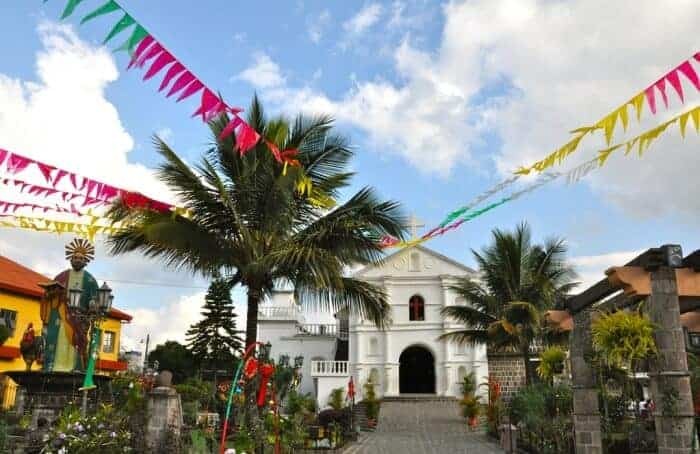 “Many visitors to San Pedro la Laguna also hike Indian Nose,” said Jose, referring to a hill that resembles a Mayan Lord. He was hopeful we might be tempted to linger longer in town. But homework beckoned and it was time to return to Panajachel. Enroute, we stopped at the market to watch as two elderly men played checkers using bottle caps, and then browsed the food stalls where the toasty smell of maize corn tortillas filled the air. 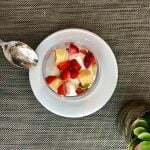 “Rich in iron and vitamins…good for energia,” said one vendor, a Maya woman wearing a lacy floral blouse. 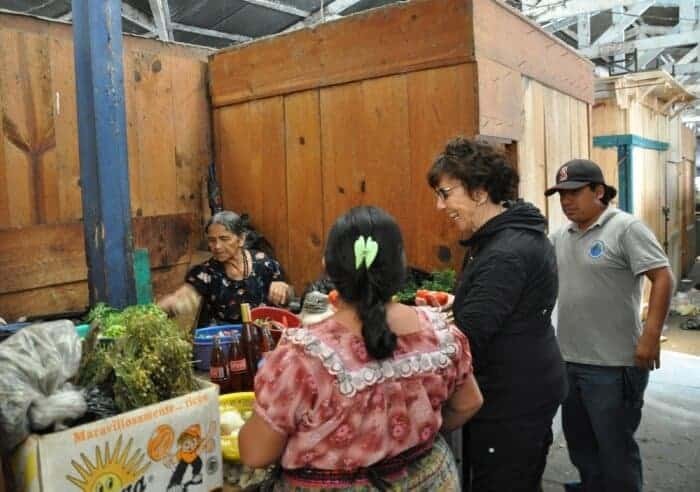 She offered us dulce de ayote, a delicious Guatemalan dessert featuring chilacayote, a long-necked squash steamed in rapadura (pure sugar cane juice) and generously spiced with cinnamon. 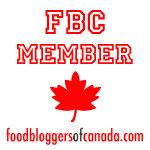 With a combination of Spanish and sign language she introduced us to other products such as chiles from Coban, tiny salted fish and avocados with dusty reptilian skin that looked like nothing we’d seen in a Canadian grocery store. Our Spanish skills exhausted, we stopped for a photo-op in front of the brightly painted statue of St. Peter the Apostle and watched a Maya woman weaving on her backstrap loom. Finally, as the setting sun slipped behind the volcano we headed back to the boat. As we left the harbour, our passage was smooth. Then, a massive thump jolted us out of our seats. It was followed by a wave even bigger than the one before it. Giant cresting waves began hitting the small boat with such force it felt like riding a mechanical bucking bronco in a western saloon. Between the howling wind, the pounding waves and the shrieks of the passengers I barely heard the answer. “It’s the Xocomil,” shouted the captain. I’d heard of the strong, sudden, midday wind that sometimes happens on Lake Atitlan after 1:00 pm but thought we’d left early enough to miss it. 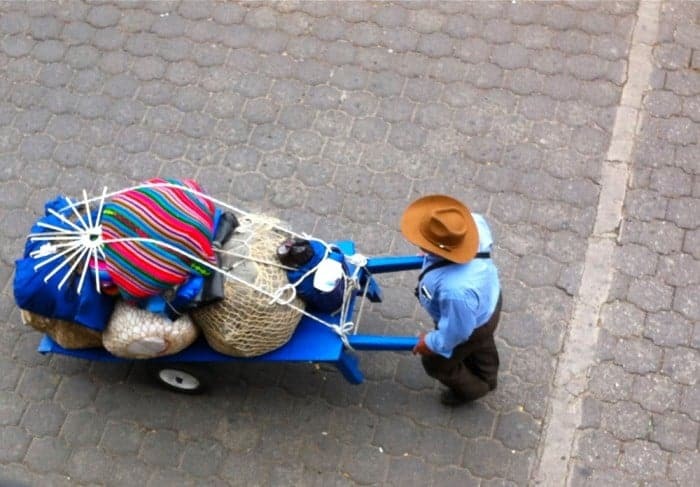 “The Maya believe the Xocomil carries away sins,” said Jose. “I knew my Spanish was bad, but I didn’t think it would be considered a sin,” I shouted, as a crushing thump threatened to catapult me right out of the boat. Each wave hammered us so hard I thought I’d surely lose a few teeth by the time we reached the other shore. Wind whipped my hair around my head and within minutes I was soaking wet. 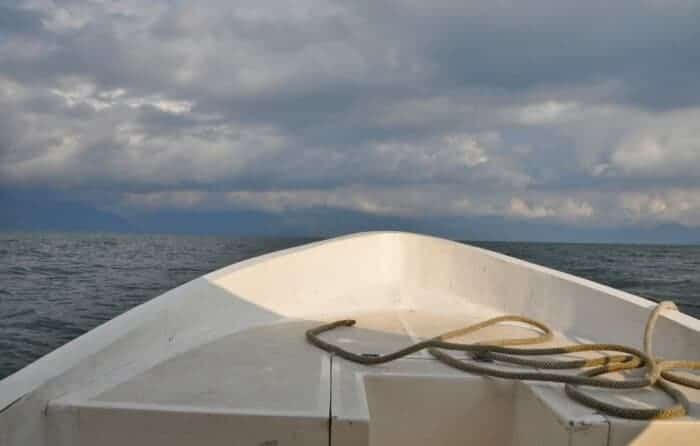 The pounding was so intense I wasn’t able to get out of my seat and move to the back of the boat where it seemed calmer. “Mierda,” cursed a Spaniard from Valencia seated near me. Dressed in slim pants and a fitted dress shirt, he unleashed a string of profanities each time a wave drenched him with cold water. The Xocomil wind might have been washing away my sins, but it was also teaching me a whole new Spanish vocabulary. Once we arrived safely but wobbly at the dock in Panajachel, I noted that while the Maya people credit Lake Atitlan’s volcanoes for having unique souls, the legendary Xocomil wind deserves top marks for personality. Ferry docks in Panajachel: There are two docks in Panajachel. A shared boat to San Pedro la Laguna costs 25 Q ( around $3) and take approximately 30 minutes. 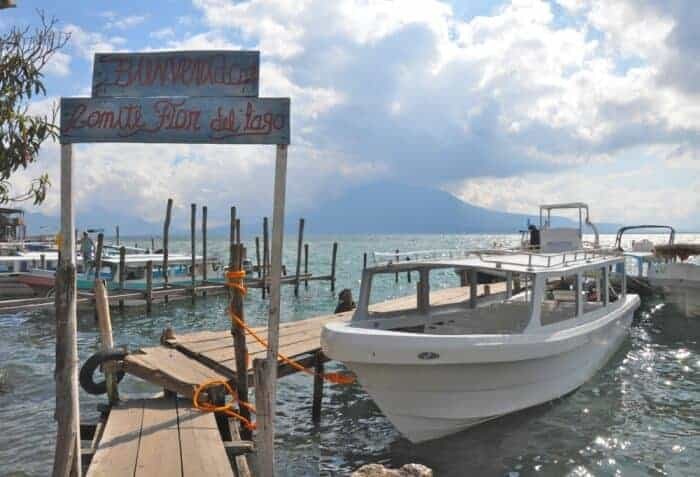 Muelle de la Playa Publica ( Public Dock): Located at the end of Calle Rancho Grande, this marina is where you catch the public boat to Santiago Atitlan, take a tour or book a private boat. 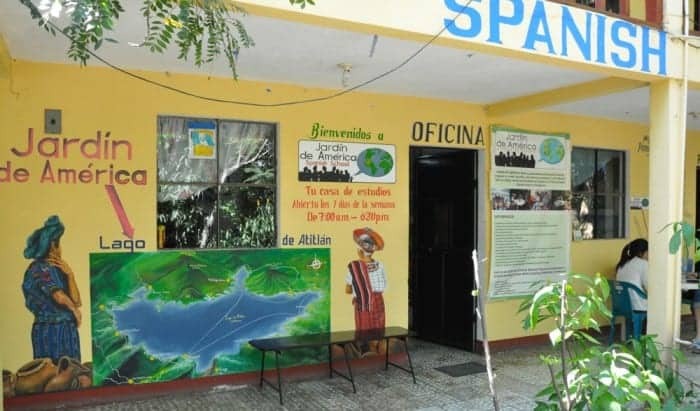 Schedule Panajachel to Santiago Atitlan 06:00-07:00-08:35-09:30-10:30-11:30-13:00-15:00-16:30. 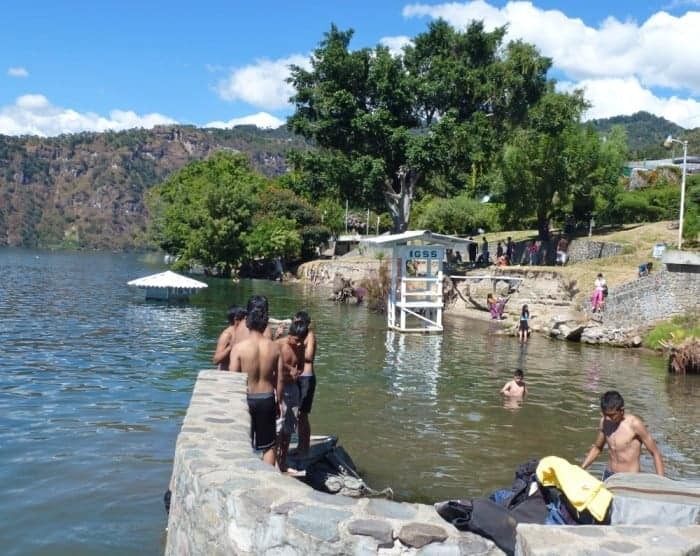 Sanitago Atitlan to Panajachel 06:00-07:00-08:30-11:45-13:00-12:30- 13:30- 14:00-15:00-16:30. Tip: Unless you have nerves of steel, the best time of day to travel is in the morning. Avoid taking the boat in the late afternoon and sit at the BACK of the boat if you can. Service can be cancelled if there aren’t enough passengers or if weather conditions are rough. Jardin de America: Study Spanish four, five or six hours daily, one-on-one with an accredited teacher. For information on other things to do in Panajachel, read my posts on Cooking Class in Panajachel and Day Pass to Luxury in Panajachel. For information on volunteering in Guatemala, check out my post on Why I’m Volunteering in Guatemala. 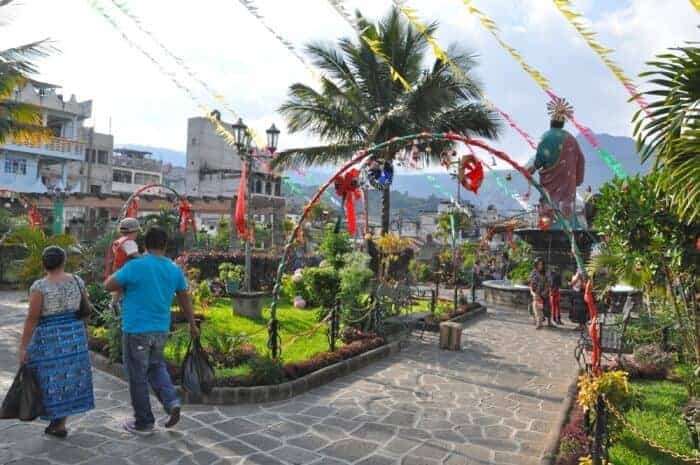 For information on how to get to Panajachel from San Cristobal de las Casas, Mexico, check out my post Night Bus to Guatemala. A version of this story originally appeared in PAX Magazine. Love this line: “to truly understand a lake, any lake, you need to immerse yourself in it.” — literally and figuratively! 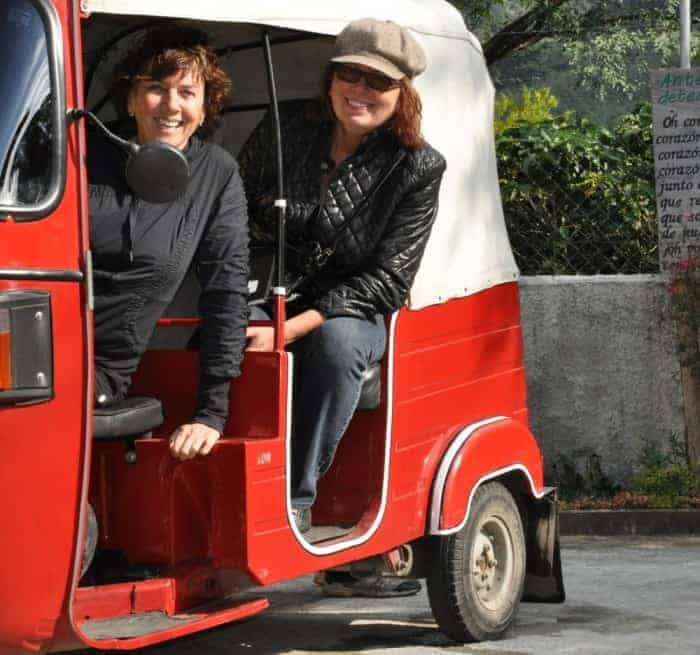 I didn’t know they had tuk-tuk’s in Guatemala — so fun! Lake Atitlan at sunset was stunning. This must be the most stunning place in Guatemala. The air looks so clear and the photos are absolutely stunning. 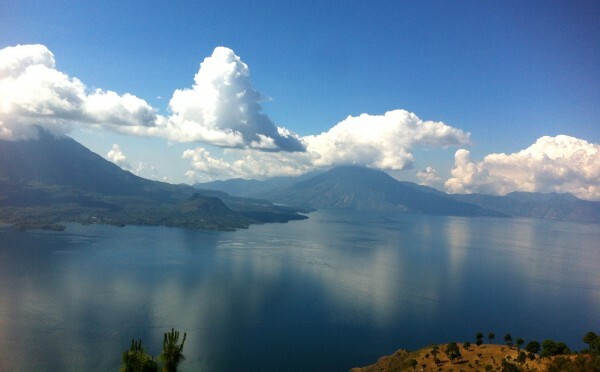 Some lovely photos from Lago Atitlan! We stayed next to the lake in Panajachel for 6 weeks (we also took Spanish classes) on the grounds of a hotel, and enjoyed the view from our RV windows every day. But during that time I learned how temperamental the climate in this region can be. What an incredible ‘day trip’! 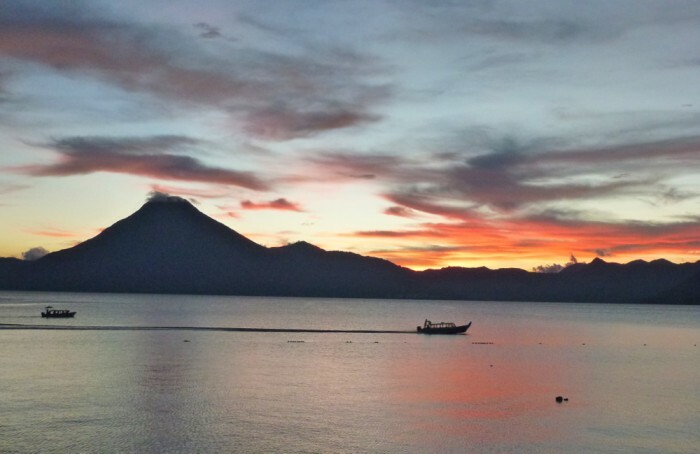 From scenic volcanoes to the mysterious Xocomil, Lake Atitlan has to be the most exciting and beautiful place ever to learn and practice Spanish. 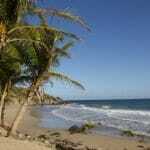 This trip to San Pedro looked and sounded perfect until I read about the boat ride back. I’m a bit nervous on water to begin with so I’m not sure how well I would have handled that. But the lake and town look wonderful. I was enjoying your trip to San Pedro La Laguna until that boat ride back. Eeeeekkk! Thanks for taking us to a region we have yet to visit. Love the sunset shot. The magnificent serenity in your photos belies the fact that Mother Nature is always in charge. I think after a cleansing of sins like the one you described, I’d head straight to the nearest bar to transgress them right back! we took that cruise across Lake Atlitlan and the imagery will stay with me always. It is so remarkably beautiful. I shall never forget it. Glad you arrived back on shore safely. How frightening! Glad you had a buddy beside you, too! Love the Huxley quote! Based on your pictures, I’d be inclined to agree with you – it doesn’t look like you could get enough of that beauty.